A love story following two remarkable strong- willed people fleeing their unnamed country on the brink of civil war and emerging as refugees with an uncertain future trying to hang on to their history and each other. Realistic, terrifying, yet oddly hopeful. The writing comes further alive through the introduction of magical doorways. Hamid is a gifted writer, and this is a timely and urgent story. One of the best books I have read in 2017! A New York Times bestseller, the astonishingly visionary love story that imagines the forces that drive ordinary people from their homes into the uncertain embrace of new lands. In a country teetering on the brink of civil war, two young people meet—sensual, fiercely independent Nadia and gentle, restrained Saeed. They embark on a furtive love affair, and are soon cloistered in a premature intimacy by the unrest roiling their city. When it explodes, turning familiar streets into a patchwork of checkpoints and bomb blasts, they begin to hear whispers about doors—doors that can whisk people far away, if perilously and for a price. As the violence escalates, Nadia and Saeed decide that they no longer have a choice. Leaving their homeland and their old lives behind, they find a door and step through. . . .
Exit West follows these remarkable characters as they emerge into an alien and uncertain future, struggling to hold on to each other, to their past, to the very sense of who they are. Profoundly intimate and powerfully inventive, it tells an unforgettable story of love, loyalty, and courage that is both completely of our time and for all time. 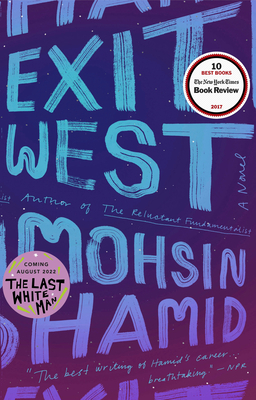 Mohsin Hamid is the author of the international bestsellers Exit West and The Reluctant Fundamentalist, both finalists for the Man Booker Prize. His first novel, Moth Smoke, won the Betty Trask Award and was a finalist for the PEN/Hemingway Foundation Award. His essays, a number of them collected as Discontent and Its Civilizations, have appeared in The New York Times, the Washington Post, The New York Review of Books, and elsewhere. He lives in Lahore, Pakistan.